Warning: Don't let your PC max out! To get the most out of your files, photos and music, you need a hard drive that can handle them. If you fear that you're running out of space, we can help you. After determining what you need, we'll install and configure a new drive that will have your PC running at peak performance. 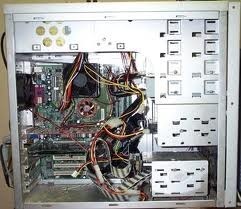 Whether you need an entire computer or computer spare parts we are the smart choice. When you select us, we ensure that the software selected by you correspond with the built-to-order hardware system that runs your software efficiently. We have well qualified team which can also fully install and support complete systems so that they perform as desired by you. We have attained expertise in incorporating different brands of hardware into one cohesive and compatible working unit which gives maximum output through proper alignment. We also provide personal computers of leading companies like Lenovo, IBM, HCL, HP, Dell's etc. Applebytes IT Solutions is a dynamic and progressive young company with a clear objective - to provide our clients with innovative and cost-effective business solutions through the efficient deployment and integration of information technology. The organisation brings together a multi-disciplined team able to undertake every aspect of consultancy, infrastructure design, sourcing, installation and ongoing support. It is a team with the ability to deliver quickly and efficiently to your every need. As your technology partner, we will work with you to create a competitive advantage using rapidly emerging technologies such as Internet commerce and Intranet tools, always ensuring a versatile and reliable platform for your information systems that can adapt to changing business priorities. Our relationship with many of the key technology providers ensures we can offer expert independent advice on the most advantageous networking, hardware and software solutions for your organisation. Whatever the nature of your business, the size of your company or the scope of your IT requirement, we offers the professional skills and resources to empower your business to communicate, compete and succeed in a rapidly changing world. Our company provides a full range of technology services and support to our customers. Our company has a team of computer professionals specialized with experience in all aspects of computer services for home or small office use as well as the more sophisticated, completely integrated systems designed for small and medium size businesses. In addition, our staff will assist you, if need be, in getting the most of your existing equipment by increasing its performance or suggesting additional hardware for more capabilities. We are familiar with all operating systems versions from Microsoft, Mac and Linux. We can also configure personalized systems, better adapted to your needs. Once we understand your specific needs, we will make the adequate recommendations to suit your needs. As our work is fully guaranteed, not only the installation is without fault, but also proper maintenance is insured.